Bruce Wayne''s slick ride can now help lock out your wheels! Using the official digital files from the Warner Bros. archives, QMx has crafted a highly detailed, 2-inch replica of one of Batman''s most famous rides. 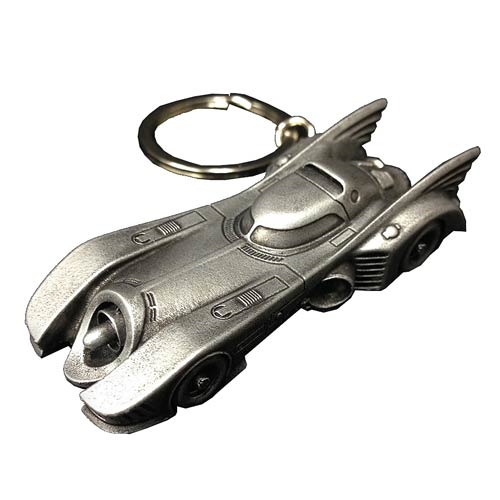 Cast in a solid steel alloy, the Batman 1989 Movie Batmobile Key Chain is 2 1/2-inches long and comes equipped with a key ring, ready to latch on to your keys or even your own utility belt. The Batman 1989 Movie Batmobile Key Chain is the latest addition to QMx''s line of collectible metal vehicles - collect them all, and your keys will always have a sweet ride! Ages 14 and up.